Lynx Africa Body Spray 150ml is part of the lynx male grooming range and has been our best selling deodorant spray for over a decade. An exotic mixture of warm African spices and aromas, this classic fragrance will give you a real presence. A few quick spray is all you need for a lasting, great smelling fragrance that makes a lasting impression. Stay fresh all day with Lynx Body Sprays. Shaking the can well and holding it 15cm away from your chest and body, spray in a well ventilated area for great protection from style threatening odour. Whatever the occasion, it lasts all day long. Avoid contact with your eyes and broken skin. Stop use if rash or irritation occurs. Now available as a 48 hour Anti-Perspirant, this classic fragrance is designed to keep you cool and dry no matter where the heat's coming from. Boost your sweat protection with Lynx Africa Anti-perspirant mens deodorant 150ml and try it alongside our Lynx Africa Body Wash 250ml. Why not also try Lynx Daily Fragrance, a sophisticated every day fragrance for men. Use daily by spraying on neck and wrists. Refresh your style with Lynx Signature, Adrenaline and Urban Daily Fragrance 100ml. Also available as a travel size mini deodorant 35ml. 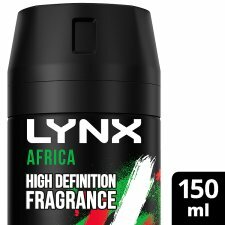 To explore the range of Lynx deodorants and find the best deodorant for you, visit lynxformen.com/uk.